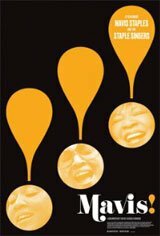 The first documentary on gospel/soul music legend and civil rights icon Mavis Staples and her family group, The Staple Singers. With dynamic live performances, rarely-seen archival footage and conversations with musical legends Bob Dylan, Bonnie Raitt, Levon Helm, Chuck D, Sharon Jones and more, MAVIS! reveals the struggles and successes of her journey.